I’m now convinced that there are few finer places in the world than the Mornington Peninsula. It is little wonder so many Melburnians flock here in summer. Apparently the population grows from about 135k to over 250k during the holiday season. The variety of experiences to be had in a relatively compact area is quite remarkable. Surf beaches, bay beaches, strawberry picking, horse riding, lighthouses, rich people house perving, eating, spas, antiques, boutiques and more wineries than you can poke a stick means it’s difficult to get bored. For me, the attraction of three fine breweries tops it all off. 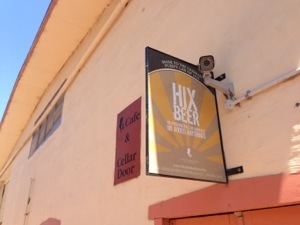 I’ve written about Hix Beer before having been introduced to it at the Supper Club in Spring Street, Melbourne. 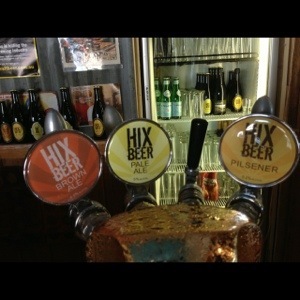 I predicted then I’d need to get to Dromana to get into more of the Hix Beer range. I actually didn’t think that’d happen. 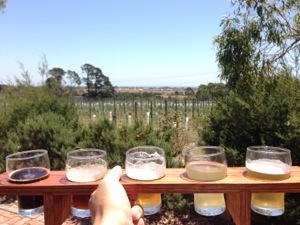 Well, fortunately I was able to make it to Hickinbotham of Dromana and try some more of their beautiful beers at the source. Yet again, this is another lovely place to sip away. Hickinbotham of Dromana is principally a vineyard and the very rustic tasting room and restaurant are next to rows and rows of grapes. I grabbed my paddle and sat in some welcome shade and gazed over the vines to Port Phillip Bay. 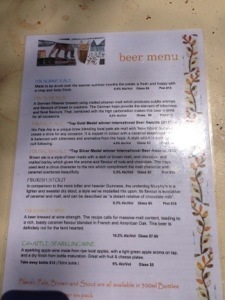 The paddle was a good ‘un even with the substitution of a cider for the pilsner. The Pale Ale is a real stand out for me. Even better off the tap, from what I remember tasting from the bottle the first time I tried it. It’s a real lip smacker with long lasting bitterness. The Summer Ale is deliberately subtle and could be sculled all day. HoD’s point of differentiation is an Irish Stout that looks to imitate Murphy’s which I’ve only ever had out of a nitro can. Whilst not that smooth, it is still pretty silky. I can see where they’re coming from with their self-description “a distant relative of chocolate milk”. It is mild but malty and I’m glad to have a 500ml bottle for later. Always enjoyable trying beers off the tap and if you get to the Mornington Peninsula, you’ve got to get to Hickinbotham of Dromana. Great post mate – you are punching them out! !